There are cakes you dream of. The ones that come to you in your sleep. Whether it's a simple family favorite, or the most decadent cake you have ever had the honor of eating. The pieces of this cake rattled around in my brain for a while, trying to find the perfect angle in which they all fit. 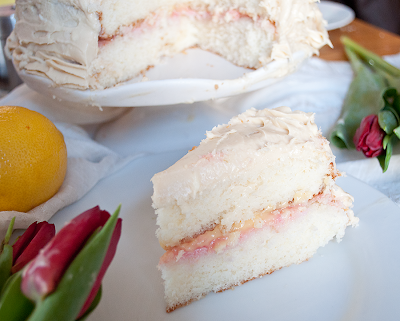 This is not a cake you make spur of the moment, it can be an all-day affair. If you're a little bit brighter than I was, you'd prepare the filling in advance, cutting down your cooking time by a bit. However, if you're like me and like to spend a Saturday playing in the kitchen, you can do this all on one day. Just be patient. It's a virtue, I hear. You'll want a special occasion as well. In this case, I was welcoming spring for my Happy Spring Dinner, which was part of this months 24x24 by Foodbuzz. I had friends and family gathered around my table for some good eats, good drink, and even better conversation. That's all the special occasion I need. I find those kind of the evenings are the ones that are the most perfect. I've had my taste-testers at my full-time job try this cake out. They've pronounced it the best thing out of my kitchen yet. I can't argue, because when I took my first taste, I had to say the same. It's a special cake, a happy one. It is certainly a labor of love, but one that's definitely worth the end result. I hope you can enjoy this cake as much as I have. Put your oven rack in the middle position and preheat oven to 350 degrees. Grease two cake pans, and line the bottoms with parchment paper, set aside. In 2-cup glass measure, combine milk, extracts, and egg whites. Mix with a fork until blended. Now, in a bowl, mix together cake flour, baking powder, sugar and salt. Now add your butter and using an electric mixer (or stand mixer) on slow speed, beat until the mixture resembles moist crumbs. Next, take your milk and add all of it, save 1/2 a cup, to the butter/flour mixture. Beat at medium speed (high for hand mixer) for a couple of minutes. Add the last 1/2 cup of milk and beat for about 30 seconds more. Now, scrape down the sides of the bowl and mix on medium for another 20 seconds. Divide your batter between the two cake pans. Bake for 17 or so minutes or until a toothpick inserted in the middle comes out cleanly. Allow to cool completely in cake pans on a wire baking rack until you're ready to assemble the cake. 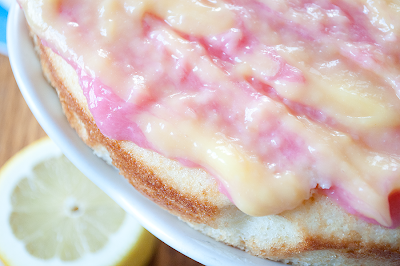 While the cake is cooling, make your fillings and frosting, let's start with the Rhubarb Compote, shall we? Put all ingredients into a saucepan and cook over low-to-medium-low heat until combined. For the cocktail, you want to put this cooked down rhubarb into a food processor and process until smooth. It can be used as-is for baked goods. In a saucepan, whisk together all ingredients except butter (lemon juice, sugar, egg yolks, eggs, and salt). Once it's melted, turn the heat up to moderate (I did it over medium-high) and keep whisking. The mixture will thicken. As David says, if you can take your whisk out of it and it holds shape, you're there. Now take the curd, press it through your strainer and then transfer to a bowl. It can keep for up to a week in the fridge. First off, whisk together your brown sugar, cornstarch and powdered sugar and set aside. In the bowl of a standing mixer (or in a regular bowl with a hand mixer), beat together cream cheese and butter until fluffy. Add your vanilla extract to the cream cheese/butter mixture. Finally, add your dry ingredients to the mix and beat until fluffy and light. If it's a little thin (mine was not) go ahead and put it in the fridge for a little bit to firm up. Take your cake, still in the pans and cooled, and transfer the first layer to your cake stand or plate. 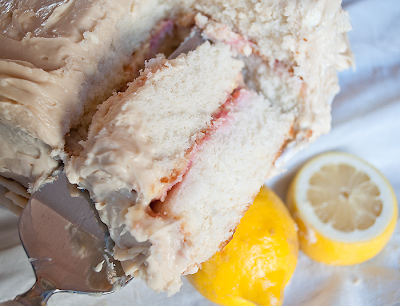 Using a cake knife or bread knife, level the dome off the top of your cake. 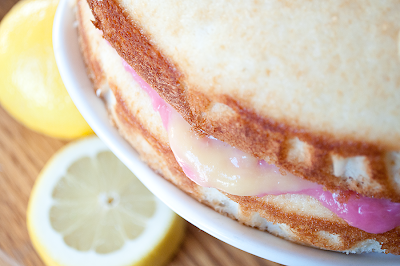 Once level, take a heaping amount of your lemon curd and cover that first layer to your desired thickness. Now, pour a good amount of your rhubarb compote on top of the lemon curd and spread to cover and swirl with the lemon. Next, take your other cake layer and place on top of your filling. You want to again level out the layer using a cake or bread knife. Once that's done, let's create your crumb coat for your frosting. Spread a thin layer of your brown sugar cream cheese frosting across the top of the leveled cake, and along the sides. 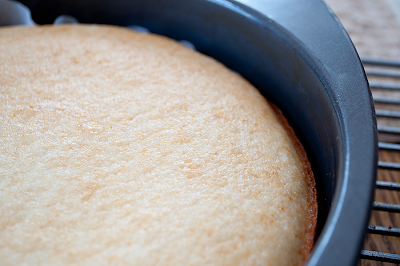 This layer will pick up any of the crumbs, allowing you to create a smooth coating of frosting on top. Finally, you can frost away. Cover the top and sides with a thick layer of the frosting (because you can't have enough frosting) and pipe (using a pretty open tip) some along the bottom and the very top (where it meets the sides). I do this because I'm not a great decorator and this covers up all my mistakes. Finally, after all that work... enjoy it! I know I did! Oh wow. This looks like one of those all-day affairs that takes less than 10 minutes to completely demolish. Absolutely glorious! What a great mix of flavors! 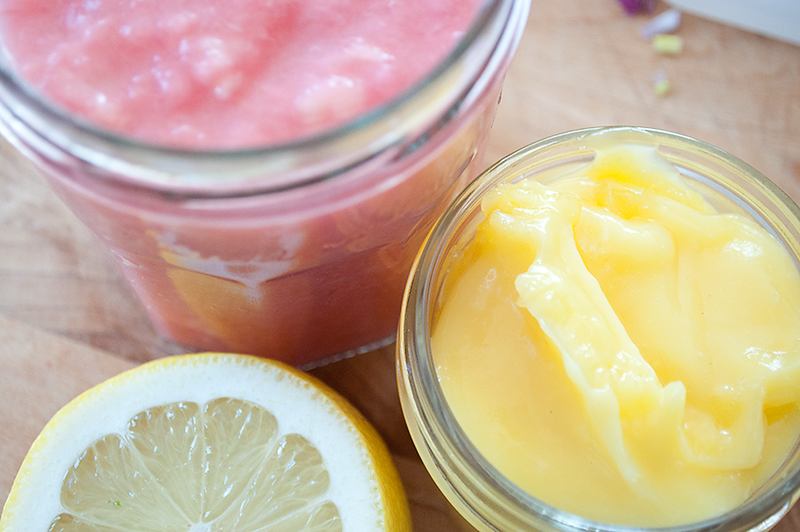 I love lemon curd, and any excuse to use it. 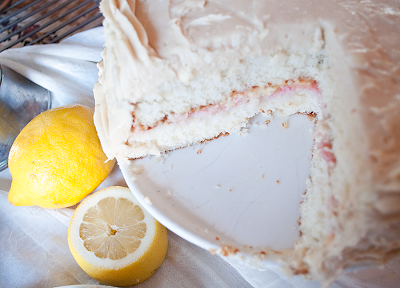 Add in some rhubarb and you've got a winner cake in my mind! ha, that was my problem. I brought the rest to work so I wouldn't eat any more of it! 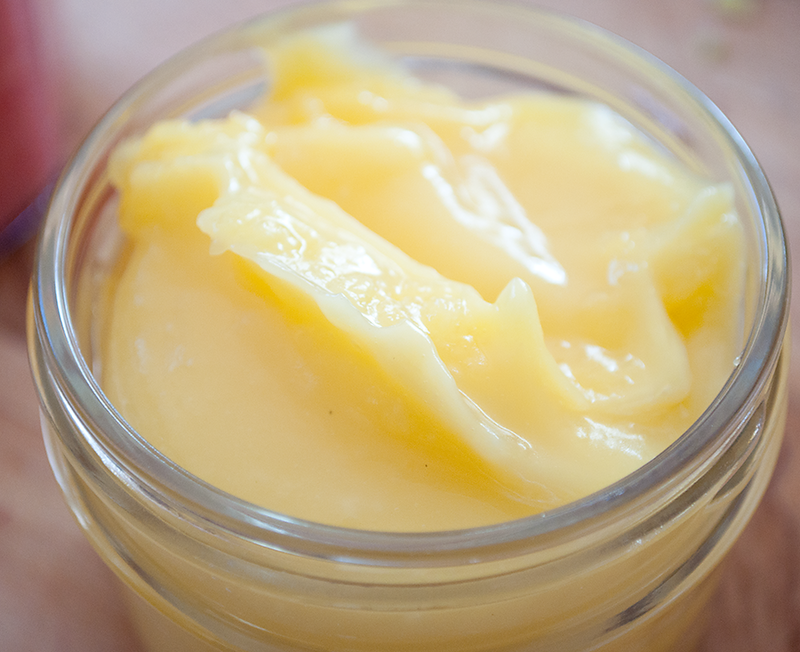 I melt over lemon curd. It's a winner on pretty much anything! Looks so light and delicious!! Love this recipe! Since reading this post, I've been on a cake baking frenzy and have been looking for ways to make tasty desserts with a healthier twist. In the past month, I've made this cake on 3 different occasions with a few variations: I used whole wheat pastry flour instead of white cake flour. I used a Splenda/Sugar blend instead of regular sugar. And I used a Splend/brown sugar blend instead of normal brown sugar. The third time I made the cake, I took the rhubarb compote and turned it into a strawberry-rhubarb mousse. Every time, the cake tasted amazing! The reason I keep trying new things with the recipe is because I'm trying to find the perfect combo for my wedding cake. THANK YOU for this recipe! It's my new favorite! That is such an amazing compliment! I'm so glad you enjoyed it and have been able to adapt it in a bunch of different ways! Good luck finding your perfect wedding cake! Congrats!